The latest reviewed version was checked on 25 February 2019. There are 3 pending changes awaiting review. Structural Functionalism is a sociological theory that explains why society functions the way it does by emphasizing on the relationships between the various social institutions that make up society (e.g., government, law, education, religion, etc). The structural-functional approach is a perspective in sociology that sees society as a complex system whose parts work together to promote solidarity and stability. It asserts that our lives are guided by social structures, which are relatively stable patterns of social behavior. Social structures give shape to our lives - for example, in families, the community, and through religious organizations. And certain rituals, such as a handshake or complex religious ceremonies, give structure to our everyday lives. Each social structure has social functions, or consequences for the operation of society as a whole. Education, for example, has several important functions in a society, such as socialization, learning. Thus, one of the key ideas in Structural Functionalism is that society is made-up of groups or institutions, which are cohesive, share common norms, and have a definitive culture. Robert K. Merton argued that functionalism is about the more static or concrete aspects of society, institutions like government or religions. However, any group large enough to be a social institution is included in Structural Functionalist thinking, from religious values to sports clubs and everything in between. Structural Functionalism explains that the way society is organized is the most natural and efficient way for it to be organized. Gender inequality offers a good illustration. According to Structural Functionalist perspective, women being subordinate to men allows the wage-earners to function smoothly as everyone in the society knows his or her respective position in the hierarchy. The implication is that, because society is functioning smoothly with gender stratification, such stratification is acceptable and efforts should not be made to change the arrangement. This example illustrates that Structural Functionalism is generally seen as being supportive of the status quo. Another key characteristic of Structural Functionalism is that it views society as constantly striving to be at a state of equilibrium, which suggests there is an inherent drive within human societies to cohere or stick together. This is known as the cohesion issue. Societies strive toward equilibrium, not through dictatorial mandate by the leaders of society but rather because the social structure of societies encourages equilibrium. For example, Jim Crow laws in the southern United States were a formalized version of informal structural advantages that empowered whites. Because of the history of slavery in the southern United States, whites had amassed more wealth than blacks. During slavery, whites controlled the government and all of the major institutions in the South. After slavery ended, whites continued to control many of these institutions, but because they were outnumbered in some areas by blacks, threatening their dominance, they instituted formal laws, Jim Crow laws, that allowed them to maintain their structural advantages. And whites were able to pass these laws because they already controlled many of the social institutions instrumental in the passage of laws (e.g., courts, government, businesses, etc.). Thus, the advantages whites had prior to a change in society allowed them to maintain their advantages after the change through both informal and formal means because of the structure of society. Structural Functionalism does much to explain why certain aspects of society continue as they always have, despite some phenomena being clearly less beneficial for society as a whole (e.g., Jim Crow laws). However, Structural Functionalism falls short in explaining opposition to social institutions and social structure by those being oppressed. There are a number of key assumptions in Structural Functionalist theory. One of these, that societies strives toward equilibrium, was detailed above. Another assumption is that institutions are distinct and should be studied individually. Structural Functionalists look at institutions individually as though they are divorced from other institutions. This is a mistake, as institutions are interlinked in society and those employing a structural functionalist approach should be taken into consideration the network of relationships that exist between these institutions. Social cohesion describes the bonds that bring people together in a society. In order for groups to be cohesive in a social context, positive membership attitudes and behaviors have to be produced and maintained. Social cohesion can be looked at on both an individual and group level. Individual-levels include: an individual’s desire or intention to remain a part of a group, her attitudes and beliefs about the group, the individuals’ intention to sever, weaken, maintain, or strengthen her membership or participation in a groups, and her susceptibility to group influence. Social cohesion at a group level is directly affected by the individual members. Social inequality refers to any scenario in which individuals in a society do not have equal social status. Areas of potential inequality include voting rights, freedom of speech and assembly, the extent of property rights and access to education, health care, quality housing and other social goods. Social inequality is an important characteristic of Structural Functionalism as the theory assumes, since inequality exists, there needs to be a certain level of inequality in order for a society to operate. One possible function of inequality is to motivate people,as people are motivated to carry out work through a rewards system. Rewards may include income, status, prestige, or power. Interdependence is a central theme in structural functionalism; it refers to the parts of society sharing a common set of principles. Institutions, organizations, and individuals are all interdependent with one another. Equilibrium, in a social context, is the internal and external balance in a society. While temporary disturbances may upset the equilibrium of society, because of social structure, society will eventually return to a balanced, orderly state. That society strives toward equilibrium also means that changes happen slowly. Propositions are proposed relationships between two concepts. This section explores some of the propositions of structural functionalism. One proposition derived from Structural Functionalist theory is that people have social capital, and that greater amounts of social capital translate into benefits. Well integrated members of an institution (those with substantial social capital) will remain members of the institution in order to maximize the potential of their social capital. Schepens found support for this proposition by examining religious switching; less than 5% of church members in the Netherlands shift their church associations during their lifetime, conserving and maximizing their social capital. One of the assumptions of Structural Functionalism is that a society is cohesive if it consists of various intermediate groups which share the same norms. This assumption leads to another proposition: The higher the level of integration between these intermediate groups, the more cohesive society will be as a whole. The absence of social cohesion can result in greater violence toward others and one's self. The diagram below is a general conceptual diagram of Structural functionalism. It shows that all of the different organizations and institutions in society are interdependent. When one institution in society changes, other institutions accommodate that change by changing as well, though the ultimate effect is to slow overall change. 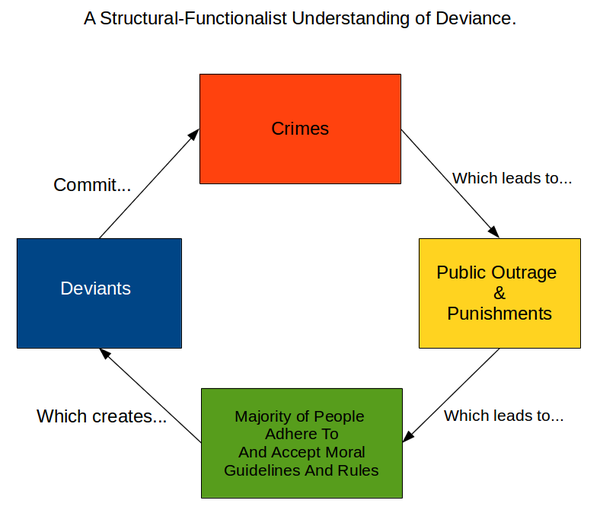 Below is a chart depicting how deviance is functional for society and how society responds to deviance. A "deviant" individual commits an act that is deemed by the rest of society as criminal, because it leads to public outrage and punishments. Because a large portion of society respond to the action as though it is deviant, this draws a boundary between what is and is not deviant. Thus, deviance actually helps to indicate what is not deviant, or, the function of labeling behaviors or ideas as deviance is to insure that most people do not engage in those behaviors. Functionalism developed slowly over time with the help of many sociologists in different parts of the world. Perhaps the most significant contributors to the initial development of this theory are Émile Durkheim and A.R. Radcliffe-Brown. However, we begin with Herbert Spencer. Herbert Spencer, an English sociologist, was a forerunner of formalized Structural Functioanlism. He is best known for coining the phrase "survival of the fittest" in his book Principles of Sociology (1896). Spencer’s intention was to support a societal form of natural selection. One of the primary focii in Spencer's work was societal equilibrium. Spencer argued that there is a natural tendency in society towards equilibrium. Thus, even when the conditions of the society are altered, the resulting changes to the social structure will balance out, returning the society to equilibrium. In the late 19th century French Sociologist Émile Durkheim laid the primary foundations of Structural Functionalism. Durkheim's theory was, at least in part, a response to evolutionary speculations of theorists such as E. B. Tylor. Durkheim originally wanted to explain social institutions as a shared way for individuals in society to meet their own biological needs. He wanted to understand the value of cultural and social traits by explaining them in regards to their contribution to the operation of the overall system of society and life. Later the focus for structural functionalism changed to be more about the ways that social institutions in society meet the social needs of individuals within that society. Durkheim was interested in four main aspects of society: (1) why societies formed and what holds them together, (2) religion, (3) suicide, and (4) deviance and crime. Durkheim addressed his first focus in his book, The Division of Labor in Society. Durkheim noticed that the division of labor was evident across all societies and wanted to know why. Durkheim’s answer to this question can be found in his idea of "solidarity". In older, more primitive societies Durkheim argued that "mechanical solidarity kept everyone together. Mechanic Solidarity here refers to everyone doing relatively similar tasks. For instance, in hunting and gathering societies there was not a substantial division of labor; people hunted or gathered. Durkheim theorized that shared values, common symbols, and systems of exchange functioned as the tools of cohesion in these societies. In essence, members of society performed similar tasks to keep the community running. In more modern and complex societies individuals are quite different and they do not perform the same tasks. However, the diversity actually leads to a different form of solidarity - interdependence. Durkheim referred to this as "organic solidarity.". Organic solidarity leads to a strong sense of individuals being dependent on one another. For instance, while a construction worker may be able to build homes for people, if he is injured on the job, he will turn to a doctor for treatment (and probably a lawyer to sue his employer). The division of labor in society requires specialization, and the result is organic solidarity. Durkheim's work on suicide was also tied to structural functionalism. In his book, Suicide, Durkheim hypothesized that social relationships reduced the likelihood of suicide. By collecting data across large groups in Europe, Durkheim was able to distinguish patterns in suicide rates and connect those patterns with other variables. Throughout the book, Durkheim explained that the weaker social ties a society possessed the more likely they were to commit suicide. Inversely, the greater the cohesive bond between individuals the less likely one was to commit suicide. One concrete example Durkheim explored was the difference in solidarity between Protestants and Catholics. Due to a variety of factors, Durkheim argued that Protestants had lower social solidarity than Catholics, and their weaker bonds resulted in higher rates of suicide. Thus, solidarity helped maintain societal order. Another thread in the development of Structural Functionalism comes from England, where it emerged from the study of anthropology in the early twentieth century in the theorizing of Bronislaw Malinowski and A.R. Radcliffe-Brown. Malinowski argued that cultural practices had physiological and psychological functions, such as the satisfaction of desires. Radcliffe-Brown’s structural functionalism focused on social structure. He argued that the social world constituted a separate "level" of reality, distinct from those of biological forms (people) and inorganic forms. Radcliffe-Brown argued that explanations of social phenomena had to be constructed at the social level. To Radcliffe-Brown this meant that people were merely replaceable, temporary occupants of social roles, that were of no inherent worth. To Radcliffe-Brown, individuals were only significant in relation to their positions in the overall structure of social roles in society. In the United States, functionalism was formalized in sociological thinking by Talcott Parsons, who introduced the idea that there are stable structural categories that make up the interdependent systems of a society and functioned to maintain society. He argued that this homeostasis is the critical characteristic of societies. Parsons supported individual integration into social structures, meaning that individuals should find how they fit into the different aspects of society on their own, rather than being assigned roles. Parsons saw social systems as "a plurality of individual actors interacting with each other in a situation which has at least a physical or environmental aspect, actors who are motivated in terms of a tendency to the "optimization of gratification" and whose relation to their situations, including each other, is defined and mediated in terms of a system of culturally structured and shared symbols." The foundation of Parsons’ social system is the status-role complex, which consists of structural elements or positions that individuals hold in a system. These positions are referred to as statuses and are occupied by individuals who must carry out the roles in order to maintain the order of the system. Therefore, within this social system individuals perform certain roles to fulfill the system’s functions; these roles are a function of their statuses. As society progresses there are new roles and statuses that occur, allowing individuals to express their unique personalities resulting in individualism. Another important aspect of Parsons’ social systems argument is his theory of action. Parsons developed the theory of action based on the idea that the decision making of an individual in a social system has motivational significance to himself. The individual is constantly reminded of the norms and values of society, which binds him to society. The individual is, therefore, motivated to reach personal goals that are defined by their cultural system and simultaneously these goals benefit society as a whole. Structural functionalism was the dominant approach of sociology between World War II and the Vietnam War. In the 1960’s Structural Functionalism was quite popular and used extensively in research. It was “… perhaps the dominant theoretical orientation in sociology and anthropology”. However, by the 1970’s, it was no longer so widely credited. "Structural Functionalism has lost much importance, but modified it directs much sociological inquiry." On September 11, 2001 modern American culture was disoriented due to an attack . This event affected both American travel customs, reflecting the Structural Functionalist idea that a change in one element of society results in changes in other aspects of society. Before the attacks, airport security in the U.S. existed, but they changed substantially as a result of the attacks. Scrutiny of travelers was heightened and included new protocols, like the removal of shoes, belts, and eventually liquids, as well as random, more detailed screenings. Thus, a change in the cultural sense of security resulted in a corresponding change in travel protocol. Modern technology has resulted in substantial changes to the economy and the military. Before the advent of telephones, the internet, and video conferencing, most business meetings occurred face to face. If an individual had a business proposal for a company in San Francisco but lived in New York, she would have to travel to San Francisco. Modern technology has changed this, reducing the necessity of business travel. As a result, the function of face to face meetings in business has changed; they are no longer a necessary part of social interactions and have therefore begun to lose their structural role. Likewise, the traditional approach to war between two nations was an all-out invasion involving hundreds of thousands if not millions of troops. During WWI, America sent over two million men to fight. During WWII, America sent over eleven million soldiers to fight. During the Korean War America sent approximately 1.5 million troops. And finally, in 1990, just over 700,000 soldiers fought in Operation Desert Storm. Due to the increase in military technology and new military tactical norms, the number of military personnel present in war zones has dramatically decreased. When America invaded Iraq in 2003, they sent 150,000. Modern technology, including advanced, long-range weapons and unmanned drones, have changed the function of mass invasions. ↑ a b c d Hak, Durk. 2007. "Stark and Finke or Durkheim on Conversion and (Re-)Affiliation: An Outline of a Structural Functionalist Rebuttal to Stark and Finke." Social Compass. 54, 2:295-312. ↑ a b c Sjoberg, Gideon. Contradictory Functional Requirements and Social Systems. Sage Publications, Inc., June 1960. ↑ a b Friedkin, Noah E. 2004. Social Cohesion. Annual Review of Sociology. 30:409-25. ↑ Durkheim, Emile. Division of Labor in Society. N.p. : Free Press, 1997. ↑ a b Perrin, Robert G. 1973. “The Functionalist Theory of Change Revisited.” The Pacific Sociologist Review 16,1. ↑ Bottomore, Tom. Competing Paradigms in Macrosociology. Annual Review of Sociology, Aug. 1975.